The Minneapolis Park and Recreation Board (MPRB), USA Football and the Minnesota Vikings are proud to announce the 16th annual Jeff Robinson/Minnesota Vikings Youth Skills Development Camp. 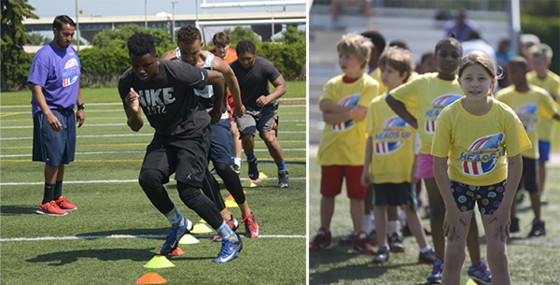 The four-day camp will run from June 7–10 at Parade Stadium (400 Kenwood Parkway, Minneapolis). Admission to the development camp is FREE. Registration is now open and closes June 3 at 5 pm. Space is limited. Note: MPRB is aware that June 7 is the last day of Minneapolis Public Schools. However, facility availability and volunteer schedules required the camp to begin June 7, and dates were selected before school calendars were available. Missing a day of camp will not impact a player’s successful camp experience. Participants will work on throwing, catching, footwork, tackling and 7-on-7 drills. Registered participants will receive one free T-shirt and free breakfast and lunch. Parking is available at a pay lot between the Parade baseball field and football fields. Next Post 42nd Avenue Reconstruction Project Meeting Monday, May 16, 2016 starts 6:00 p.m.